Are you requiring a Sales Person to develop net new business from their direct prospecting activities (cold-calling, networking, social media, etc. ), or to generate additional opportunities and revenue from existing customers? This is probably the most important distinction you need to make right at the start of your process as everything else in the recruitment / hiring cycle depends on its answer. 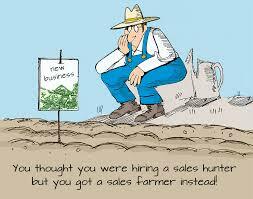 Typically referred to as “Hunters” or “Farmers”, both sales roles are complementary to each other and very valuable. The Hunter is just that: a professional Sales Person who focuses on establishing new business relationships based upon the business challenges that they uncover, and then create customized proposals that align their solution(s). A Hunter does not like getting ‘bogged down’ in day to day administrative issues, nor routine customer service. They live for the ‘hunt’, and once a sale is completed they gently migrate the relationship to an Account Manager to go on to their next target. An Account Manager is NOT a fit for this role, and will not succeed. An Account Manager, or Farmer, is also a professional Sales Person who focuses on growing opportunity within existing accounts through proactive Account Management. They are the customer’s main contact and advocate for their company, taking care of administrative and invoicing issues, and any other challenges, while keeping their eyes open for new opportunities to do additional business. A Farmer typically does not like prospecting cold, and is usually much more comfortable at maintaining existing relationships than initiating new ones. A Hunter is NOT a fit for this role, and will be miserable. Occasionally a position may ask for a Sales Person who can do both these roles. But this is not wise planning as overall the Account Management issues take time away from the energy required to do the ‘hunting’ and is generally not recommended. Analyze if your Sales team has both these roles on it and hire accordingly for your requirements. Do you have an understanding of the market value for each of these two roles? A Hunter generally is the more senior of the two positions as much more skill and experience is required. There is no ‘magic formula’ in new business development; it’s just hard work, plain and simple. If Sales was easy, everyone would be doing it. The market value for a Hunter needs to reflect the length of new sales cycles when they are initiated from scratch, and the senior experience required to manage multiple stakeholders and keep the Sales process on track. An Account Manager is not such an entrepreneurial-style position and calls for a very customer service oriented Sales Person who can maintain and grow existing relationships. While still a very valuable position, it is a more settled and ‘familiar’ role. The market value should take into consideration though the number of clients in the existing portfolio that they will have to manage. If you are requiring a Hunter, but are only willing to compensate for an Account Manager, you will get an Account Manager who will tell you that they can hunt. A Hunter will not be interested in their pay range. Unfortunately, this is one of the most common hiring mistakes made and the costliest as by the time you figure out your new Sales Person is more comfortable working with existing accounts and / or ‘warm’ leads, rather than hunting for new ones, precious time has been wasted with no sales pipeline being created. If you want a Hunter, be prepared to advertise clearly for this skill set, and to pay for it. This is a key person who will grow your business for you. Do you interview specifically to understand the Sales Methodology that your candidates practice, or not? All professional Sales People, whether Hunters or Farmers, follow and practice sales methodologies which allow for a structured approach to business development. The most common and well-proven ones are Consultative Sales, Question-Based Selling, and SPIN Selling. If your candidate is not sure, or if they just say they’ve ‘got the gift of the gab’, move on. The best Sales People are adept in intelligent questioning and have superb listening skills. The worst Sales people are ‘talkers’, and telling ain’t selling. A Sales Person with a solid methodology is versatile and agile, and can sell in a variety of industries. Don’t be afraid of hiring one from outside of yours if they can demonstrate their success in practicing it. Do you ask for ‘war stories’, backed up by customer references? The best Sales People always have a story about a prospect or account when the odds were stacked against them, and how they overcame the obstacles to win the customer. This could be either an example of cold-calling a prospect who always RFP’d at contract renewal yet consistently stayed with the same incumbent, and how they differentiated themselves to turn the tables and win the business. Or the customer who was so fed up with lack of customer service and attentiveness to their account that they were threatening to take their business to a competitor, and how they ‘saved’ the business. Real life, relevant stories tell the history of their own Sales experience and unique personality, and should always be asked for. If there are none, then there are none.. and probably won’t be at your company either. Do you, yourself, have an understanding of the Sales cycles involved so that your expectations, quotas, etc., are not unrealistic? For example, how long is your average prospecting cycle (cold call to first discovery call / meeting), how many discovery meetings are typically required, how long is the actual sales cycle from discovery meeting to proposal creation, how long from there to contract negotiations and then finally to implementation? If you do not know this information, then you cannot accurately create or convey a quota expectation. If you expect to have a deal far in advance of what your historical sales cycle is (and be stringently honest in evaluating this), you are setting up the Sales Person, and your company, for failure. In summary, if you increase your own knowledge of B2B Sales and the corresponding Sales roles, you’ll increase your chances of recognizing, and hiring, top Sales People. Outsourcing this function to a company that has the knowledge and experience of Recruiting for Sales People is a very good option to consider. We will not only determine the type of Sales expertise you require, but also ensure that their contributions will be aligned with Sales Management’s goals.